The following is a guest review by Chad Beeler of BassEFX.com . If you are interested in guest posting, please contact me! Reverb is the persistence of sound in a particular space after the original sound is produced. (Thanks, Wikipedia) It’s a natural occurrence that can be manipulated to varying degrees according to the size of a room or hall, or more artificially in by use of plates or springs. It’s fitting, then, that boutique pedal master Taylor Livingston, the man behind Iron Ether, named his reverb pedal the Nimbus, which is another natural phenomenon: a giant, dark, and precipitous cloud formation. And like the cloud, the Nimbus Bass Reverb is capable of creating an ominous presence. At least that’s what I found at one end of the spectrum of its ability. The rest of its spectrum resides in and out of the box. But it’s the out of the box thinking behind the Nimbus Bass Reverb that sets it apart. 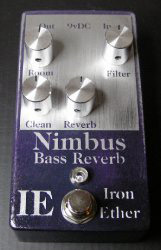 Iron Ether is able to do this because the Nimbus is built on a high-power DSP (Digital Signal Processing) system with a custom, in-house designed reverb algorithm. The Nimbus, like most of the other Iron Ether pedals, is hand painted and etched, so no two look exactly alike. It’s got a low knob count, four: Room Size, Filter, Clean, and Reverb controls. In its simplicity lies exceptional variability, without having to flip a switch to select a desired reverb type. The Room knob gives you a range that goes from small practice space, to larger rooms, to massive concert halls with long ambient decay. The Filter control helps make this pedal bass-centric . That’s because it’s a high pass filter, which affects only the reverb and maintains the low frequencies and punch of the bass; counter clockwise-less bass response, clockwise-more bass response. The Clean and Reverb knobs control the level of each signal respectively. The way Taylor describes it is to imagine oneself inside the reverberant space. So, when you turn up the Clean volume, you are moving your “ear” closer to the instrument, and when you turn up the Reverb your are moving back into the reverberated space and away from the instrument. Lots of ambient loveliness awaits I’m sure. Whoa! Forgot to turn down the Room Size first. Well, that’s a happy accident, because I am treated to the most giant sound I’ve ever created with one pedal. Ominous, really. Like a really bitchin’ preset you might find on a set of Moog Taurus Pedals. Now then, with Room and Reverb pegged, and Clean volume all the way back, I observe the decay time. Grabbing my watch to count the seconds, I let rip an “E” power chord with moderate attack then mute it. Egads! One freakin’ minute passes before the note dissipates completely. After retrieving my jaw from the floor, I reel the whole thing in with a very small room and just a hint of reverb and the Clean knob most of the way up. It’s subtle, but it thickens things up nicely. In the end, all of the knobs have gotten a healthy workout. It does everything you’d need it to do and finding the correct amount of the effect is rather easy once you get used to the controls. And since there aren’t many, it doesn’t take much time getting up to speed. The Iron Ether Nimbus Bass Reverb is capable of taking your sound from an intimate gig, to a large hall, to a massive, subterranean cave. Presuming, of course, the cave has an outlet. But it’s able to replicate all types of reverb: room, hall, and plate, with a very simple layout. Typically, bass players are reluctant to use reverb as a creative tool. Where would you use it? But, after sampling the Iron Ether Nimbus Bass Reverb, I would be determined to find a place for it. Fuzzrocious Rat King Give Away!